This recipe comes to us from our head bread baker, Martin Philip. 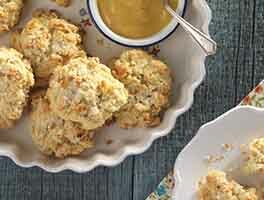 The scones are as tender as can be and feature a medley of aromatic spices. Martin recommends freshly grinding your own spices with a spice mill or mortar and pestle for optimum flavor. This recipe was excerpted from Breaking Bread: A Baker’s Journey Home in 75 Recipes by Martin Philip, photography by Julia A. Reed, Copyright © 2017. It has been reprinted with permission of Harper Wave, an imprint of HarperCollins Publishers. Weigh out your flour; you’ll find its weight by toggling to “ounces” at the top of the ingredient section above. Or measure it by gently spooning it into a cup, then sweeping off any excess. In a medium bowl whisk together the flour, baking powder, baking soda, salt, and ground dry spices. Add the cold butter, tossing to coat with the dry ingredients. Then press the butter pieces between your thumbs and forefingers into small flat pieces, or "leaves." Pat the dough into a circle 1" thick and 7" across. You may chill the dough until set for easier cutting. Cut the dough into eight wedges with a chef's knife, cutting directly down; don't saw. Arrange the scones evenly on the prepared pan. Bake the scones for 18 to 22 minutes on the top rack, rotating after 14 minutes, until they're light gold and firm to the touch. Remove the scones from the oven, and serve warm or at room temperature. 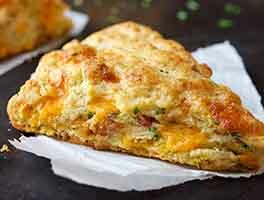 Store baked scones, well wrapped, at room temperature for 2 to 3 days; or freeze for up to 1 month. Freeze unbaked scones, well wrapped, for up to a month. To bake them from frozen, keep them covered and allow them to thaw overnight in the refrigerator before baking them as directed above. I substituted white whole wheat flour for half the all-purpose flour. They came out delicious and tender. Fifteen minutes in convection oven. My only suggestion. Made the same way basically as biscuits (the ones from the American South).. I had issue with dryness and added more cream, though this is likely my fault for being too lazy to weigh flour and scooping instead. I also didn't particularly like the way the egg wash was looking (we have our own pastured chickens and the eggs have extremely orange and thick yolks), so I added cream to that. My baking time also seemed off, when I went to rotate at 14 min. I should have gone ahead and taken them out b/c they were a tad overbaked and crunchier than I prefer. The flavor, however, is quite divine and I think some of my problems are user error. Will try again with less laziness and a more anticipatory eye on the doneness. Delicious! Just came out of the oven. 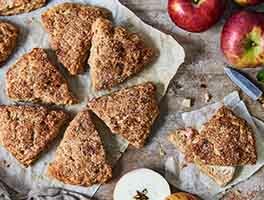 They are perfect with a cup of tea; slightly sweet, great spiced flavor, crunchy on the outside and soft on the inside. That's even with using bottled spices and whole milk. Next time, I'm going to make sure to mill my spices myself. Recipe is definitely a keeper. Thanks!! Yummo. Easy to make in processor. Didn't have cream so soured some reg milk. Just made these ginger scones! I was skeptical about the black pepper and cardamom, but everything blended together beautifully, and they're light, fragrant and delicious! Added chopped ginger to the top since I didn't have the coarse sugar. I made this recipe with full-fat coconut milk as the liquid, which worked well. The dough came together easily. 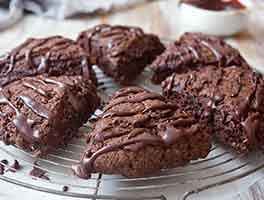 They have a subtle flavor, not very sweet, and are even better a day after baking. Next time I bake them, I will drizzle icing over the top for a bit more sweetness. 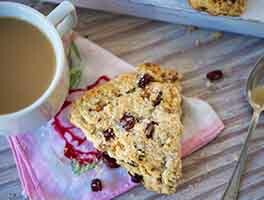 These were the first scones I ever made and they were fantastic! Only adjustments I made were 1/2 & 1/2 instead of cream, spices not freshly ground, and about twice as much crystalized ginger. I'm making them again for Mother's Day brunch tomorrow! I made these last week with no problems. They were so good I made them today. The dough would not stick together so I added more cream. Then I baked them according to the recipe and they burned on the bottom. The only thing I can think of that might have been the difference is that my butter was too cold. I used butter from the freezer and maybe did not let it thaw enough to still be cold but not room temp. No matter, well cut the bottom off and eat them...and I'll try again.